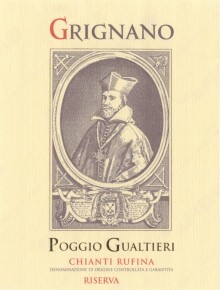 ‘Poggio Gualtieri’ is a Riserva made with 90% Sangiovese and 10% Merlot, aged partly in large barrels and partly in French barriques fro 15 to 18 months. Female wine-maker Barbara Tamburini oversees the winemaking. Rich black ruby red in color. The bouquet is intense with red berry fruit overshadowed by cedar and spice. The nose is warm with hints of vanilla and spices resulting form the oak ageing. The palate is full-bodied, well-structured, yet clean and fresh. Poggio Gualtieri will pair well with traditional Tuscan cuisine, grilled meats, pasta dishes with hearty sauces, and aged cheeses. Consistently excellent and a great value! The Sangiovese grapes are harvested towards the last week in September and 1st week of October. Merlot is harvested the 3rd week of September. Fermentation is carried out in stainless steel tanks at controlled temperature. Malolactic fermentation occurs in 18hl barrles and barriques. 50% of the wine is aged in 18hl barrels, the other 50% ages in French oak barriques for 15 to 18 months. The wine spends a minimum of 12 months in bottle prior to release.